Fig. 138 Paradox of thrift. The savings schedule rises from S to S 1, but this serves to reduce the equilibrium level of national income from Y to Y1, and the actual amount saved from Sy to Sy1. the proposition that there is an inconsistency between the apparently virtuous nature of household SAVING and the potentially undesirable consequences of such saving. If most households decide to save a larger proportion of their incomes, then they will consume less, and this reduced expenditure will lower AGGREGATE DEMAND, so leading to lower levels of output and employment. 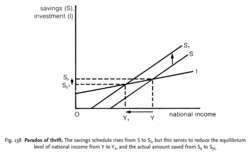 Thus, an increase in savings will reduce the level of national income. Thriftiness or saving is beneficial to the economy as it releases resources from the production of consumer goods to be used for producing investment goods. However, if households attempt to save more than businesses plan to invest at a given level of income (i.e. ‘withdrawals’ exceed ‘injections’ in the CIRCULAR FLOW OF NATIONAL INCOME), this will cause the EQUILIBRIUM LEVEL OF NATIONAL INCOME to decline, reducing also the actual amounts saved and invested. The paradox of thrift, they call it: the more saved, the less spent, the less earned. John Maynard Keynes called it "the paradox of thrift," but it's hardly rocket science. Zhen Huo, University of Minnesota, and Jose-Victor Rios-Rull, University of Minnesota and NBER, "Engineering a Paradox of Thrift Recession"
This is positive, as we do not want to be caught by the paradox of thrift. This leads Jackson to call for policies aimed at raising the domestic savings rate, which not only opens up the issue of the Paradox of Thrift, but also fails to engage with the fact that polices which favour savers will thereby favour the wealthier in society. That could actually make it harder for households to increase their savings - an effect known as the paradox of thrift. But in the long ran, the more we save, the more we invest, and the higher the level of income and rate of growth--a Paradox of Thrift. If you've read the Wall Street Journal over the last several months, you may have read an article that referenced the economic theory "The Paradox of Thrift. But as Keynes said, there is a Paradox of Thrift, which essentially means that if we all do what is right for ourselves, it is bad for the country. And we are presented with terms heretofore unknown to this generation: liquidity trap, paradox of thrift and, of course, fiscal stimulus. Reference is made by some, however, to Japan's slump and the re-appearance of the paradox of thrift and that even rarer bird, the liquidity trap.